More than 5 months after the 'new-age-monster' was official launched in India, the Volvo B9R (Marketed as Volvo 9400 6x2) makes its appearance in the Kerala market now. The Volvo B9R is longer than the Volvo B7R at 13.7 meters in length (the B7R is only 12 meters long), powerful than any other bus in India (with a 9-litre, 340hp rear mount engine) and perhaps the most expensive on the road too (at Eight-five lakh rupees). One reason that I can think for the B9R have such a delayed debut (considering the fact that the Bangalore-Ernakulam route was one where the B7R was initially introduced) is narrow roads, and sharp curves in the towns of Kerala. The B9R is now finally in Kerala! Two operators are operating these mega monsters to God's Own Country, from the Garden City. One bus is operated to Trivandrum and the other to Alappuzha. One more service is to be launched to Trivandrum very soon. 1. Sofiya Lines (Bangalore agent: Friends Travels) to Trivandrum. These buses depart from Madivala every evening at 1830 hours. The end-to-end fare is Rs. 1050. 2. 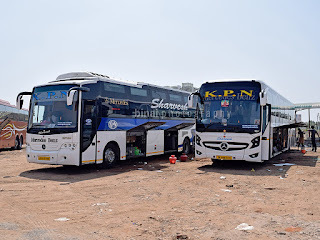 Kallada Travels (Suresh Kallada Group) operates B9R buses to Alappuzha. The bus starts from Kalasipalayam at 2030 (Madivala at 2115). The end-to-end fare is Rs. 850. Kallada Travels (Suresh Kallada) has announced new services to Thiruvananthapuram. The date of introduction of these services are unknown! My folks travelled by the same bus operated by Sharma on the Mumbai-Bangalore route. They said that it was much smoother even if you are seated on the rear seats. Sharma also actively promotes its new Merc bus on the same route. But that's not very different from the regular Volvo. However, the name sells. Last nite I got a chance to travel in new Volvo B9R which has been owned by Suresh Kallada group.The Bus is an example of extreme luxury travel on road resembles a journey in a typical aircraft.Most of the features are controlled by automatic sensors installed in the bus which makes the driver to have a stressless job. The Kallada Group is charging Rs.850/seat for a journey from Cochin to bangalore which starts from cochin at 19:00hrs and drops at Madiwala,Bangalore by 05:30 am. Sofiyalines the new Volvo B9R ( bus no 3901) met with an accident near electonic city on April 27, 2009. It was hit by a Tamilnadu corporation bus. 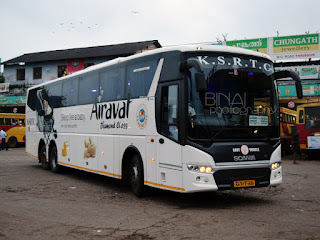 We had to end the journey at electronic city and the passengers were transfer to madiwala via KSRTC volvo (Vayu Vajra). 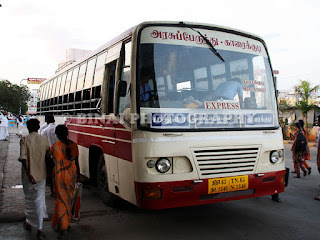 I happned to travel on this bus last week and it was amazing.The quickest time I have travelled to Bangalore in the past 6 years...13 hrs .Started from TVM @ 5:15 got dropped @ Silk board @6.oo am...It was amazing..But i felt sad how both the drivers were treating the bus....The first guy a would never change the gears .He would be running at sixth gear at 40/50 and u could literally hear the engine crying for the gears to be changed.Th e second giy was worse.He I guess thought was driving the old leyland bus.He would be on 3 rd gear running at 70 ..But whatever said we reached right ahead of the Kerala Volvo !! I travelled in Sofiya lines from bangalore to trivandrum last week. it was really an awesome journey..
took only 12 hrs to reach trivadrum. Facilities: 2 LCD monitor (one in front and one in middle), mineral water. I am rajeev I traveled kallada new volvo B9R multy axle, its like flight. We traveled in Sofiya Lines on 17/04/2010 from Bangalore to Trivandrum. The bus is good .The journey was comfortable. After traveling 3 hours from Bangalore there was a problem with the engine. They stopped the bus and tried to got it repaired by a local technician. It took nearly 3 hours to do the repair work but was not successful. We tried to contact their customer care centre and office .None of the phones was answering our call. Later they brought a mechanic from Bangalore and got the engine fixed some how. It was 3 o'clock in the night when we resumed journey. After traveling for next 2 hours it again got stuck on the road near Selam (Bhavanipuram) All the passengers deserted over there until 12 noon. Another bus took us from there. Near Kollam they asked all the passengers to transfer to another bus. When the bus reached TVM it was 10:30 night. The scheduled arrival time was 7:30 am. Just 15 hours late. Passengers lost some of their valuables during these transfers. they had changed the windshield..only thing missing is the left wiper...and also the tv invertor got damaged when i traveled from tvm to blr on june 27th..